Australian and New Zealand Army Corps - (ANZAC) Day, 25 April, is one of Australia’s most important national occasions. It marks the anniversary of the first major military action fought by Australian and New Zealand forces during the First World War at Gallipoli. The experience of the troops at Gallipoli, and their reaction to it, has come to symbolise the Anzac Spirit. The characteristics of the Anzac Spirit are described by the Australian War Memorial as loyalty to one's mates, ingenuity, courage, dogged determination and good humour in adversity. 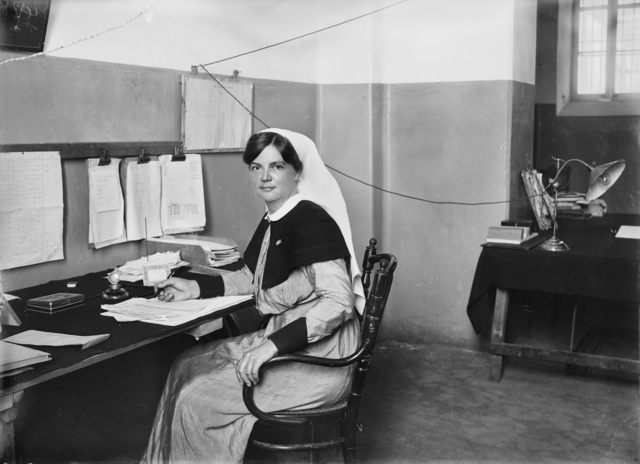 On Anzac Day this year the Australian War Memorial commemorates the role of our brave nurses in Australian armed forces, such as principal matron of the 3rd Australian General Hospital, Grace Wilson (pictured) who served on Lemnos Island during the Gallipoli Campaign. In 1929 Grace was awarded the Florence Nightingale Medal by the Red Cross, the highest international award a nurse can achieve. On the hospital ships off Gallipoli, Australian nurses came face to face for the first time with the reality of the wounded. It made some of them confront the limitations of their nursing skills and the notion of the glory of war. Right from the Gallipoli landings on 25 April 1915, nurses cared for hundreds of casualties in the hospital and transport ships anchored off-shore. Despite the constant threat of Turkish shelling or torpedoes, the exhausted nurses cleaned, bandaged, warmed, and comforted their patients, many of whom had terrible wounds or were suffering from the effects of gangrene and disease. Wards on the lower decks were crowded and poorly ventilated, and seasickness struck down nurses and patients alike. By the end of the 1st world war more than twenty Australian Army Nurses had died and seven had been awarded the Military Medal for courage under fire. Female nurses served in Australia and overseas during both the First and Second World Wars. Initially serving with the Australian Army Nursing Service, nurses were not part of the regular military until 1949. Today, both male and female nurses serve as part of the army, air force and navy, deploying with troops during conflicts or peacekeeping operations. Over recent decades the ranks have swelled and women are now found in most branches of the Australian Defence Force. From 1972 onwards, men joined the ranks within the Royal Australian Army Nursing Corps. Nowadays, women also serve as doctors and are active in all fields of military medicine. As well as treating those wounded in the wars and conflicts in which Australians have fought, military nurses also deploy on peacekeeping operations treating wounded service men and women from Australia and from other countries’ armed forces, and often local civilians. Pictured above: Grace Wilson at her desk, 1916. 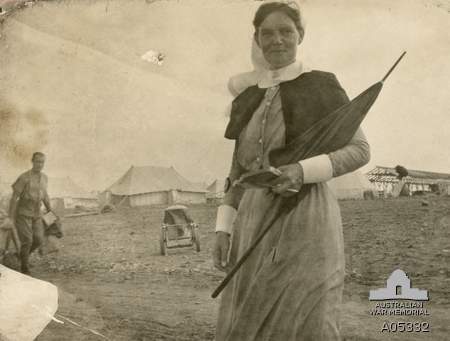 Top: Grace Wilson at Lemnos, Greece, 1915. Images courtesy of the Australian War Memorial. If you would like to learn more about this topic you can visit our catalogue. We recommend reading Australian Heroines Of World War One by Susanna De Vries or alternatively Our Vietnam Nurses by Annabelle Brayley.